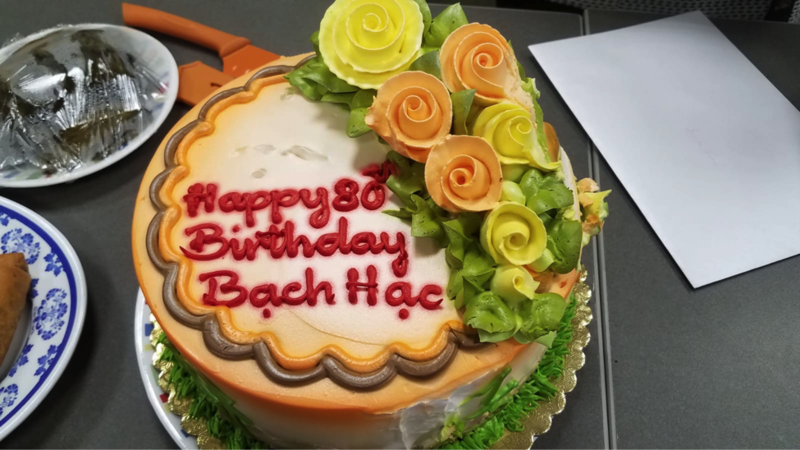 Last month we celebrated an ESL student’s 80th birthday. This student, like many others, returned year after year and in time, became like a friend to our teachers. There was much love as we gathered with other students to celebrate a significant birthday of a cherished member of our Rockspring community. Teachers, as well as students, shared delicious food while serving and honoring one another above themselves. Last week we celebrated Thanksgiving with our students. Our teachers shared the story of the first Thanksgiving and prepared a traditional turkey dinner. Our students shared delightful Vietnamese desserts. They also eagerly covered our bare Thanksgiving tree with leaves written with their reasons for being thankful. Happy smiles were on every face, as once again teachers and students shared delicious food while serving and honoring one another above themselves. God’s love often flows like wine poured into the top of a pyramid of wine glasses. The first glass fills and the overflowing wine pours itself into the 2nd cluster of glasses and then into the 3rd, 4th clusters and the flow continues until finally all the glasses are filled. This overflowing love is evident in the interactions between the teachers and students in our ESL classes. Praise God for our hardworking teachers who love their students so well! Every Tuesday and Thursday evening, I witness our ESL teachers showing God’s love. First, except for the price of their textbooks, our classes are free. Salvation is also free. The Bible makes this very clear. Our salvation, absolutely free for us, is a gift from God and our only responsibility is to receive it! Secondly, I see it in the way teachers come early to prepare their classrooms. They set up chairs, tables, audio recorders and white boards. They make sure they have enough supplies and whatever is necessary to present the best lessons for their students. Likewise, in John 14, Jesus told His disciples “I go to prepare a place for you.” Just as expectant parents lovingly prepare a place for a new baby and a hostess prepares a place for her guests, so Jesus prepares a place in Heaven for each of us. Furthermore, He is also continually going ahead to prepare our next situation. As I watched my grandchildren learn to walk, I would look ahead of them to make their path safer by removing obstacles that might cause him/her to trip and fall. God does this for us as well. With His loving eyes on us He prepares our way. He is always 100 steps ahead of us, laying out our path, preparing our steps and making arrangements for the next step of our journey. Thirdly, I see it in the way teachers warmly greet each student at the door as he/she arrives. Our teachers provide a safe and welcoming place to learn English. In the same way, God initially welcomed us into His family and continues to welcome us into an intimate relationship with Him. Fourthly, when a question relating to the lesson is asked of a student, there is no fear of not knowing the answer and being embarrassed. When he/she hesitates, a teacher or helper often steps up from behind and whispers the answer into the student’s ears. The students know that all they need to do is listen for that voice. They know that someone will be there to lovingly support them. Our students are bold and participate in classroom discussions because they know there is no need to fear. In the same way God is always present in our lives answering our questions, answering our prayers and whispering words of encouragement into our ears. All we need to do is listen for His still, small voice. There is no need to fear because the Bible says that there is no fear in love. Perfect love drives out fear. And God’s love is perfect. Fifthly, all our tests are open notes and open book. When students are filling out a worksheet or an assignment, they know that the answers are always evident somewhere in the classroom—on the white board or screen, on the walls or in their books. When we have questions of God and His ways, the answers are all around if we look and listen—in our prayers, in nature, in a conversation with another believer or in the Bible. Lastly, our purpose is to improve the lives of our students. Mastering English will open doors to better jobs and a better life. They will have access to the wider community and be able to take advantage of resources that are now unavailable to them because of the language barrier. Over the course of our time at Rockspring, we have heard many of our students’ personal stories. Many have endured suffering and tragic circumstances. Our students have had to relocate to a foreign country where there is a strange language and unfamiliar customs. We want to offer our students hope and a promising future in their new home. I cannot end without referring to our ultimate purpose and the hope of our hearts. It is found in the name of the neighborhood—Rockspring. Tremble, earth, at the presence of the Lord, at the presence of the God of Jacob who turned the rock into a pool, the hard rock into springs of water. As believers, our teachers carry with them the love and presence of God wherever they go. This is the God of Jacob who turned the rock into a pool and the hard rock into springs of water. Mighty and Powerful God, may your presence cause the ground to tremble and turn Rockspring into springs of living water for our students. May they find new life in You! Help us to be faithful so that your Name be glorified even in this place.